The stomach is a gastrointestinal organ that is responsible for preliminary digestion and destroying any potential pathogenic microorganisms that may have been ingested. It is an acidic environment with a pH that can vary between 1.5-3.5. This article will outline the production of stomach acid, the regulation of this and some clinical conditions that result from this process going wrong. HCl is produced by the parietal cells of the stomach. To begin with, water (H2O) and carbon dioxide (CO2) combine within the parietal cell cytoplasm to produce carbonic acid (H2CO3). An enzyme called carbonic anhydrase converts carbonic acid into its component ions a hydrogen ion (H+) and a bicarbonate ion (HCO3–). The bicarbonate ion is transported out of the cell into the blood via a transporter protein called anion exchanger which transports the bicarbonate ion out the cell in exchange for a chloride ion (Cl–). This chloride ion is then transported into the stomach lumen via a chloride channel. 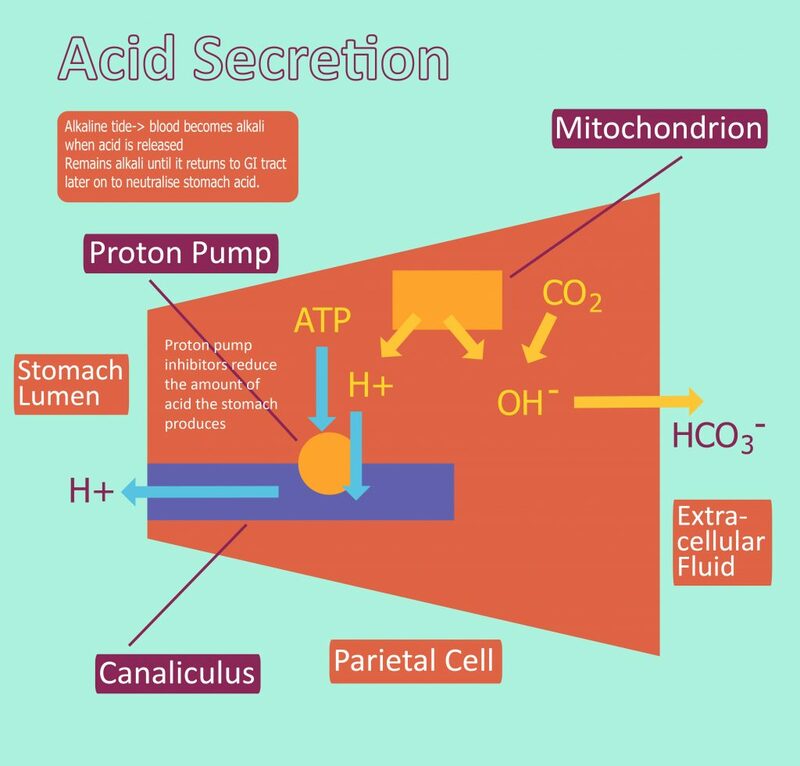 Prior to this, the hydrogen ion that was formed via the splitting of carbonic acid is transported into the stomach lumen via the H+– K+ ATPase. This channel uses ATP energy to exchange potassium ions in the stomach with hydrogen ions in the parietal cell. This results in both hydrogen and chloride ions being present within the stomach lumen. Their opposing charges leads to them associating with each other to form hydrochloric acid (HCl). Fig 1 – Diagram showing the production of Hydrochloric acid within the stomach. At rest, the number of H+– K+ ATPases present within the parietal cell membrane is minimal. The rest are sequestered within tubulovesicles in the parietal cell. Upon stimulation the vesicles fuse with the cell membrane which leads to the increased insertion of H+– K+ ATPase into the membrane, hence allowing for the increased movement of hydrogen ions into the stomach thus increasing acid production. There are three ways in which acid production is increased. The first of these is via ACh, which is released from the vagus nerve. This is released firstly during the cephalic phase of digestion, which is activated upon seeing or chewing food, leading to direct stimulation of parietal cells via the vagus nerve. It is also produced during the gastric phase of digestion when intrinsic nerves detect distension of the stomach, stimulating the production of ACh by the vagus nerve. The main regulation pathway involves the hormone gastrin which is secreted from G cells in the stomach. G cells are activated by the vagus nerve, gastrin related peptide and by peptides in the stomach lumen produced via protein digestion. Activation of the G cells leads to the production of gastrin which is released into the blood and travels through the blood until it reaches the parietal cells. Gastrin binds to CCK receptors on the parietal cells which also elevates calcium levels causing increased vesicular fusion. Finally, enterochromaffin like cells in the stomach secrete histamine which binds to H2 receptors on the parietal cells. These cells release histamine in response to the presence of gastrin and ACh. This leads to increased fusion however it is via the secondary messenger cAMP as opposed to calcium in the other methods. The are a number of ways in which acid production can be decreased. The first of these is via accumulation of acid in the empty stomach between meals. This increase in acid leads to a lower pH within the stomach, which inhibits the secretion of gastrin, via the production of somatostatin from D cells. Once food has been broken down into chyme, it passes into the duodenum, triggering the enterogastric reflex. Inhibitory signals are sent to the stomach via the enteric nervous system, as well as signals to medulla – reducing vagal stimulation of the stomach. The presence of chyme within the duodenum also stimulates entero-endocrine cells to release cholecystokinin and secretin, both of which play a variety of important roles in completing digestion, but also inhibit gastric acid secretion. Excessive secretion of stomach acid can lead to the formation of peptic ulcers. Potential complications of peptic ulcers include excessive bleeding due to erosion through a blood vessel. There are two main drugs used to prevent excessive acid formation. H2 antagonists such as ranitidine bind to the H2 receptors preventing the binding of histamine and thus reduce acid secretion. It is important to note that the other two pathways for stomach acid secretion still operate, thus acid secretion is only reduced and not completely inhibited. Proton pump inhibitors (PPIs) such as omeprazole bind to the H+– K+ ATPase, hence preventing the transportation of hydrogen ions into the stomach lumen. PPIs completely prevent stomach acid formation due to hydrogen ions not being able to react with chloride ions in the stomach. This is a state where there is a decrease in the volume of stomach acid produced. Achlorhydria can result in an increased risk of salmonella and cholera. There are a variety of causes and further tests must be undertaken to ascertain the cause to allow for a targeted treatment regime. Which cells of the stomach produce HCl? What is the main method used to increase stomach acid production? What receptor do proton-pump inhibitors block? What organisms are patients with achlorhydria NOT at an increased risk to?